What a week that gameweek 34 brought both in terms of the Premier League table and FPL teams. Leicester’s last gasp draw has them top of the table, but Spurs’ win cut their lead down to just four points with four matches remaining. Still, the Foxes have their destiny in their own hands needing just two wins to clinch the title. Meanwhile Aston Villa are relegated and both Newcastle and Sunderland have picked up massive results to inch themselves closer to safety, even though it is inevitable that at least one of the two will be going down. The race for “Wenger’s fourth place trophy” remains tight with just two points separating third from fifth while Arsenal, Man City, and Manchester United all vie for the coveted Champions League places. While gameweek 34 had 15 FPL matches week 35 features just 7 due to the FA Cup semifinals. With Everton taking on Manchester United and Crystal Palace facing Watford this also means that Norwich and West Ham are also not playing any matches. For those teams that picked heavily from Everton, not only did this not work out in week 34, but now these players are without a match in week 35. While this could be a great time to use a wildcard, if available, I would advocate for using a “mini wild card” and simply take a -4 point hit, unless you absolutely have to replace a full squad of players. For myself I had been all set to not have to make any changes to my squad for this week, but now that Gael Clichy is injured and most likely won’t play combined with Matt Targett’s loss of playing time I will most likely have to take a -4 for the week. Fortunately my 171 points in week 34 has given me some cushion for the coming weeks. While I do still have my wildcard, my plan is to save it for the week 37 double gameweek or possibly even week 38. With my triple captain played for week 34, on Sergio Aguero, I still have the Bench Boost available for week 37 and the All Out Attack ready for week 38. This sets me up well to make a final push to gain in the rankings. The one thing that I decided to do is to stop listening and reading up on other people’s advice. Previously I listened to four or five different podcasts during the week and would read up on several articles across the internet. All this really seemed to do was to make me second guess my picks and hurt my team. From here on, my plan is to forego this extra advice and follow my own instincts and statistical analysis. For week 35 sticking with Leicester, Liverpool, Man City, and Tottenham players is a great way to go considering their form and opponents. Liverpool is certainly the best pick here considering their great form and the week 37 double game coming up. As far as differentials go, Sunderland players could be one viable option to start picking up. They have been playing well lately and their fight to avoid relegation makes them very tricky opponents, even against the likes of Arsenal at home in week 35. They also have a week 37 double against Chelsea and Everton, both at home, in matches that could mean very little for their opponents, but being extremely important for the Black Cats. With the season winding down there are still plenty of interesting matches to follow. My quick picks for the weekend’s FA Cup semifinals are for Manchester United to go through 1-0 over Everton and Crystal Palace to advance 2-1 over Watford. Both matches should be interesting considering what is at stake for all four teams involved. 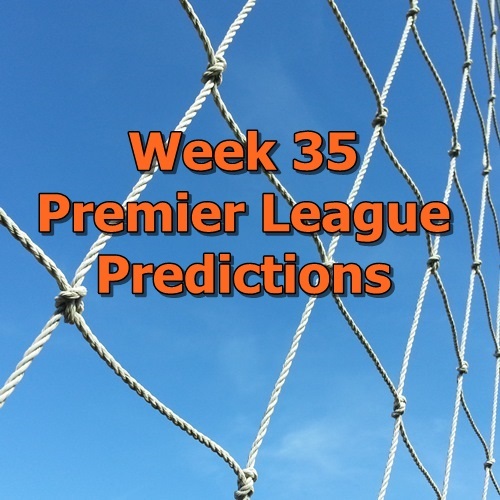 Whether you came here for the predictions or the FPL tips, I hope that you were able to take away something from this week’s article. Good luck and have fun!